Bearish individual investors pulled $63.3 billion out of U.S. stock funds in the first quarter of 2018, one of the highest quarterly outflows on record. Mean- while, America's bullish CFOs repurchased an estimated $158 billion of their firms' stock during the same period. The pace of buybacks may have been boosted by tax reform, but the first quarter is by no means unique; similar amounts were spent on buybacks during the first quarters of 2014 and 2016. The contrast is intriguing. Corporate insiders see global sales and earnings trends, and conclude they have too much cash earning too little yield. Thus, dividends and buybacks are the most logical course of action for maximizing shareholder value. Individual investors, on the other hand, continue to be subject to relentless predictions of doom by the mainstream financial media. We are constantly reminded that stock prices are too high, short-term interest rates are rising, and that tariffs may be the end of the world as we know it. So which side represents the smart money? It's not a question that takes a lot of deep thinking. In the long run, stocks are valued for their future earnings potential, and corporate insiders have a pretty good handle on what that could be for their own firms. Executives who see their stock as under-valued will tend to use surplus capital for buybacks and dividend increases; those who see their stock as over-valued will either invest their cashflow to grow organically or look for acquisition targets. While there have been famous cases where an executive team made the wrong call, they tend to be the exception, not the rule. How can companies be so healthy when so many "bad" things are happening? That too is a relatively easy question to answer. Nearly a decade after the Financial Crisis, today's savvy executive teams represent a population of survivors. Weak players are mostly gone, their market share absorbed by companies with stronger business models. While advancing technology is creating new types of disruptive competition, it is also lowering costs and making it easier to monitor all aspects of a firm's financial performance, even at the employee or customer level. For the ten years ending 6/30/18, the S&P 500's return is 10.2% per year - a figure that includes some modest P/E expansion from just prior to the Financial Crisis. Nearly half of that return has resulted from direct shareholder compensation: dividends have accounted for roughly 2 percentage points (the current yield on the S&P 500 is still about 2%), and buybacks that shrink the number of shares outstanding (boosting earnings per share) account for the rest. 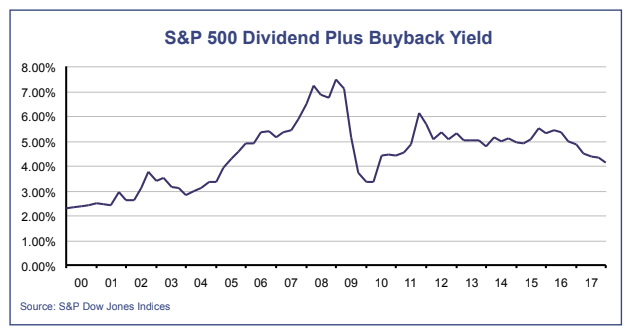 Going forward, I think it's reasonable to expect the S&P 500 will maintain a dividend plus buyback yield averaging 4% over the long run. Profitable firms that find themselves on the losing end of tech disruption will probably be compelled to boost shareholder compensation to help support their stocks. And as technology disruptors mature, they too could become big dividend payers once their profits are no longer needed to fund expansion (some have already reached that point). Organic earnings growth may be a different story. Historically, this factor has averaged 6-7% growth since World War II, thanks in part to 3-4% inflation during the period. Going forward, technology disruptor firms will put downward pressure on margins. And because they create abundance out of scarcity, there will also be downward pressure on inflation. So for the coming decades, a conservative expectation for earnings is 5% growth. That sums up to a 9% forward return projection for stocks, or about 7 percentage points better than inflation. This estimate doesn't account for any expansion or contraction in P/E ratios, which I think is reasonable. Successful technology disruptors may put upward pressure on the market's overall P/E ratio, but higher real interest rates (a result of rising productivity) could largely offset that effect, causing overall valuation levels to remain close to where they are today. The Trump Administration progressively toughened its stance on trade, escalating the threat of tariffs to include a large share of what China exports while rescinding previous exemptions on steel and aluminum for Canada, Mexico and the E.U. The moves prompted retaliatory measures that are now being implemented. Investors remained hopeful that negotiated solutions would eventually come to pass. But as the odds of that grew longer, the stock market began to discount the possibility of a slowdown in global growth. It wasn't just trade that prompted the latest round of caution. While the U.S. economy continued to roar ahead on the strength of business spending related to the corporate tax cut, many foreign economies increasingly struggled with a combination of capital flight and higher energy costs, reflected by plunging foreign currencies. The synchronized global growth theory got put to rest after the E.U. central bank announced it was abandoning plans to boost interest rates. As the dollar surged in response, the value of most foreign investments was further reduced. Our stock portfolios, which have foreign exposures of 10-25%, were negatively impacted as a result, finishing behind the S&P 500's return of 3.4% for the second quarter. Our sector model was less impacted by foreign stocks, but its heavy bet on financials suffered as renewed debt concerns in Europe became headline news. Bond-wise, the stronger dollar appeared to limit the upward pressure on yields in June, although bond fund declines in April and May still made for another negative quarter (Barclay's U.S. Bond Index pulled back 0.2%). Our bond holdings lagged due to rising long-term interest rates and increased credit risk in the emerging market and high-yield bond segments. The threat of widespread tariffs has many investors on edge, but it's important to note that the main focus so far has been on goods. Services, which account for about a third of U.S. exports, are more or less getting a hall pass. Economically speaking, that means only 8% of our GDP is potentially affected (the portion represented by exports of goods). Could trade restrictions alone bring about a U.S. recession? It seems unlikely. The economic risk is much higher for Canada, Europe, Japan, Mexico and China. Goods exports in those countries are 2-5 times greater than that of the U.S. (relative to the size of their economies). From an investment standpoint, it's quite clear that foreign stocks have greater downside risk if the trade environment remains hostile. Most of our current foreign exposure is focused on Asian technology firms, which we are holding for now. If current trade negotiation efforts fail, we may look to trim our foreign exposure and possibly shift our domestic holdings more toward service- oriented industry groups. A bigger recession risk, in our view, is interest rates. An increasingly hawkish Fed, combined with low long-term rates in foreign developed markets, suggests the domestic yield curve may go flat between now and the end of 2019. Without a profitable lending spread, banks might rein in lending activity, which could weigh on the domestic economy. Depending on the degree of relief from lower oil prices in that timeframe (which would reduce inflationary pressures and help limit the upward trend in consumer lending rates), the risk of a recession could rise to around 40-60%. For now, we are reducing our overweight in the financial sector. If recession risk starts climbing, we may look at other defensive measures. While it has not been a fun six months for bond investors, we think the worst is over for the income side of our portfolios. Long-term corporate yields, relative to inflation, are relatively high at this point. And they are also somewhat constrained by foreign markets, which make U.S. yields appear attractive and safe by comparison. Given this backdrop, we've decided against any near-term changes in our bond allocations. Going forward we'll be looking for opportunities to maximize yield while sticking to our risk targets.